Powerful neutralizers knock-out malodors in the air...leaving the restroom clean, fresh and comfortable. Biodegradable surfactants descale and help prevent stains and organic build-up in the fixture and trap. • Cleaning action leaves urinals and toilets sparkling clean, reducing the need for maintenance and inspection. • Prevents unsightly stains and scaling. • Continuously neutralizes malodors in the air and at-thesource. • Consistent, pleasing fragrance levels. • Reinforces perception of clean restrooms. • Audio tone reinforces refill L.E.D. • Resets the smart chip counter. 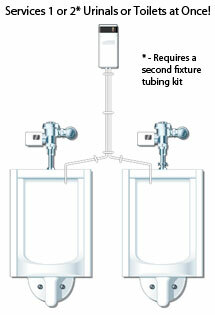 Can service two fixtures with a 2nd fixture tubing kit Stock# 401290.